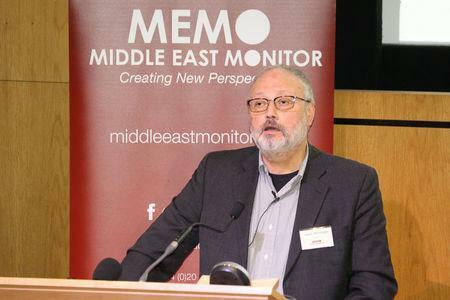 WASHINGTON/LONDON (Reuters) - Saudi Arabia on Sunday called the killing of journalist Jamal Khashoggi at its Istanbul consulate a "huge and grave mistake," but sought to shield its powerful crown prince from the widening crisis, saying Mohammed bin Salman had not been aware. The comments from Foreign Minister Adel al-Jubeir were some of the most direct yet from Riyadh, which has given multiple and conflicting accounts about Khashoggi's killing on Oct. 2, first denying his death and later admitting it amid an international outcry. The weeks of denial and lack of credible evidence in the face of allegations from Turkish officials that Khashoggi had been killed have shaken global confidence in ties with the world's top oil exporter. U.S. Treasury Secretary Stephen Mnuchin said Saudi Arabia's admission that the Washington Post columnist was killed in a fistfight was a "good first step but not enough," though he added it was premature to discuss sanctions against Riyadh. Three European powers - Germany, Britain and France - pressed Riyadh to provide facts, and Chancellor Angela Merkel said Germany would not export arms to Saudi Arabia while uncertainty over Khashoggi's fate persisted. Late on Sunday, the Saudi Press Agency said both Saudi King Salman and Prince Mohammed had called Khashoggi's son, Salah, to express condolences. Jubeir, the Saudi foreign minister, had extended condolences to Khashoggi's family earlier on Sunday. "This is a terrible mistake. This is a terrible tragedy. Our condolences go out to them. We feel their pain," Jubeir told the U.S. broacaster Fox. "Unfortunately, a huge and grave mistake was made and I assure them that those responsible will be held accountable for this." He said the Saudis did not know how Khashoggi, a Saudi national and U.S. resident, had been killed or where his body was. He also said Prince Mohammed was not responsible. "This was an operation where individuals ended up exceeding the authorities and responsibilities they had. They made the mistake when they killed Jamal Khashoggi in the consulate and they tried to cover up for it." Khashoggi vanished after entering the consulate to obtain documents for his upcoming marriage. After two weeks denying any involvement in the 59-year-old's disappearance, Saudi Arabia on Saturday said Khashoggi, a critic of the crown prince, died during a fight in the building. An hour later, another Saudi official attributed the death to a chokehold. "Nothing can justify this killing and we condemn it in the strongest possible terms," Germany, Britain and France said in their joint statement. "There remains an urgent need for clarification of exactly what happened ... beyond the hypotheses that have been raised so far in the Saudi investigation, which need to be backed by facts to be considered credible." Reflecting international scepticism over its account, a senior Saudi government official laid out a new version that contradicts previous explanations. The latest account includes details on how 15 Saudis sent to confront Khashoggi had threatened him with being drugged and kidnapped and killed him in a chokehold when he resisted. A member of the team dressed in Khashoggi's clothes to make it appear as if he had left the consulate. Turkish officials suspect Khashoggi was killed inside the consulate by the Saudi agents and his body cut up. Turkish sources say authorities have an audio recording purportedly documenting Khashoggi's murder. In a speech on Sunday, Turkish President Recep Tayyip Erdogan appeared to suggest he was getting ready to release some information about the Turkish investigation, and would do so at his weekly speech to members of his ruling AK Party in parliament. Erdogan has remained largely silent on the case, although Turkey's pro-government newspapers have released information about events at the consulate. "I will make my statements about this issue on Tuesday at the party group meeting," Erdogan said. For Saudi Arabia's allies - particularly in the West - the question will be whether they believe that the prince, who has painted himself as a reformer, has any culpability. King Salman, 82, has handed the day-to-day running of Saudi Arabia to him. "I am not satisfied until we find the answer. But it was a big first step, it was a good first step. But I want to get to the answer," Trump told reporters this weekend, when asked about the Saudi investigation and Riyadh's firing of officials over the incident. In an interview with the Washington Post, Trump said that "obviously there's been deception, and there's been lies." A leading Republican U.S. senator said he believed the crown prince was behind the killing, adding that the Saudis had lost all credibility in their explanations of his death. "Yes, I think he did it," Bob Corker, chairman of the Senate Foreign Relations Committee, told CNN, referring to the crown prince. According to the senior Saudi official, the Saudi team rolled up Khashoggi's body in a rug, took it out in a consular vehicle and handed it to a "local cooperator" for disposal. richard: AND COMEY SAID ANYONE ELSE WHO WAS NEGLIGENT WITH CLASSIFIED EMAILS (SPEAKING OF HILARY) WOULD BE PROSECUTED.